Police in Great Britain set up concrete barriers around the German Market in Birmingham to prevent Muslims from bombing Christmas shoppers. Police arrested six Muslim terror suspects this week. They were reportedly plotting a Christmas bombing attack. 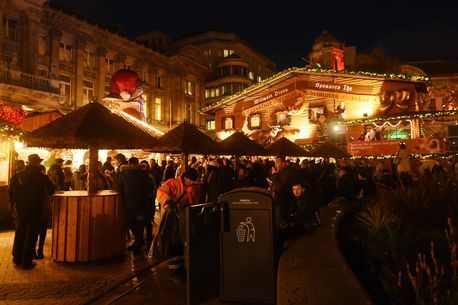 The Birmingham German Market is very popular with up to 5.5 million visitors a year. Police are continuing to quiz six terror suspects amid claims shoppers may have been targeted in a Christmas bombing plot. A 27-year-old man from Burton upon Trent in Staffordshire was arrested on Monday on suspicion of engaging in the preparation of an act of terrorism. Four men from Derby, aged 22, 27, 35 and 36, and a woman, aged 32, from London were also arrested on suspicion of the same charge. The police swoop came after it emerged concrete bollards have been put up around the Birmingham’s popular German Market to protect visitors from terrorist attacks. The bollards were put up in Colmore Row and Bennetts Hill t o safeguard the thousands who flock to the seasonal city centre attraction each day. It is estimated that 5.5 million people will visit the market before it closes on December 29.